Events [Webinar] Can Digital Analytics Lead to Promotion? 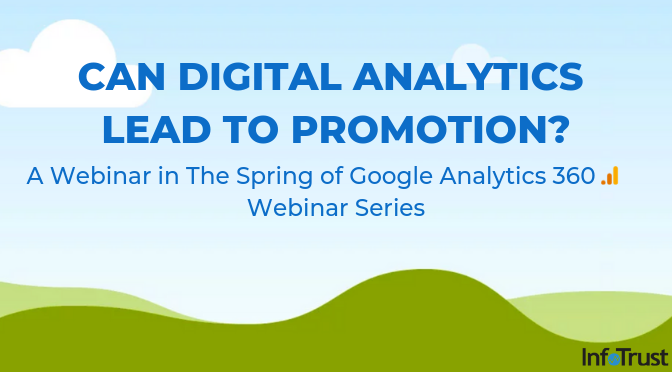 [Webinar] Can Digital Analytics Lead to Promotion? As someone who leverages data analytics for a living, here’s a fun fact: Of all the people who engage with InfoTrust 45% get a job promotion within two years. When our team sees an interesting trend like that, we tend to dig deeper to better understand what’s driving such a fascinating trend. By the end of this webinar, you’re going to see just how powerful being in the data analytics field is for your own personal career growth, while simultaneously delivering incredible results for your company. It turns out that there are seven discrete ways using data analytics can help you get promoted–we’ll walk through all seven in this webinar. Perhaps your next data analytics project won’t just help your company — it may very well help you get your next job promotion. Join us on Tuesday, May 14 at 1 PM EDT to learn more!